The #HITsm tweetchat on Friday, June 17, 2016 discussed six topics related to “Addressing Healthcare via Non-Medical, Community-Based Resources and Tools.” In previous posts I shared curated tweets from Topic #1, Topic #2 & Topic #3. In this post I will share curated tweets from Topic #4. 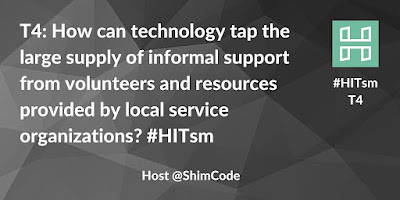 Topic #4: How can tech tap large supply of informal support from volunteers and resources provided by local service organizations? 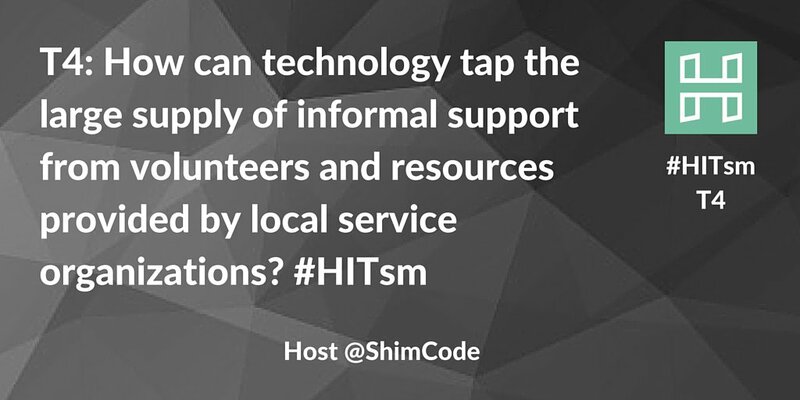 @shimcode: It can point out specific services/resources to specific individuals based on caregiver defined needs. @mandibpro: Easy. #Datamining #tech can curate/categorize resources. If person OKs info-sharing, cross-ref participants. @matt_r_fisher: Create communities and organize directories. Think this was said before. Tech great way to bring diverse info together. @nxtstop1: Since libraries R go-to community resource areas w/computers, internet & training> Like centralized local social support website. @matt_r_fisher: Think many are surprised at just how much libraries are still used. I go all the time and get odd looks. @mloxton: Isn't Ushahidi sort of that? Geospatial problem marker with ability to have volunteer orgs respond? @2healthguru: Considering all public funding troughs into healthcare ecosystem, should be a standard, MJ. @mandibpro: If "in need" means homeless veteran panhandling on street corner and missing shoes, thinking tech not his. @shimcode: People and programs offering resources can be kept updated about individual needs. Many temporary programs underutilized. @2healthguru: General rule? Those who need it, don’t use. Those who don’t (need it) do? @ochotex: Messaging apps can unite everyone... Getting those to agree to be united is the hurdle! @glhc_hie: EVERYONE talks about Patient Engagement, but it's hard, messy, and absolutely necessary! Tech is a means, NOT an end! @jwander14: If using technology, need HIPAA compliant platform/portal for non HCP community-based team. @glhc_hie: With #mHealth apps and trackers, patient data can be auto-reported through passive or regular interaction. The information shared on Topics #5 and #6 are coming soon. In the meantime, for more information on healthcare data, technology and services, consider following me on Twitter.